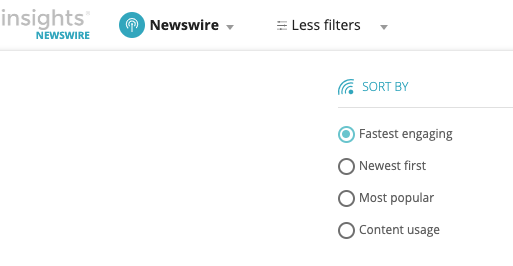 Newswire allows users to alter the sensitivity of the text matching algorithm. There are two options to adjust, which I will briefly explain. Text Similarity: This is matching done on a sentence by sentence basis. Our algorithm checks how similar each sentence from the outlet's story is to the original Newswire story. The with the slider set to strict, each sentence matched will be very similar to the original sentence written. When it is 'Loose', the order of words within each sentence may be quite different, but they'll qualify as a match. Content Usage: This is represented by a percentage figure. The higher the figure, the more of the original article text has been used. Setting the slider to "High" will show matched articles that have used a significant percentage of the original story. The lowest setting: "Off", will show story matches that may have used a single quote. Both of these options can be adjusted in the Advanced Filtering panel. 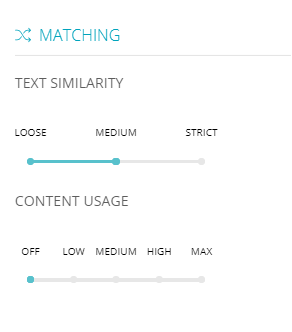 By default, the text similarity is set to Medium and the Content usage to Off. 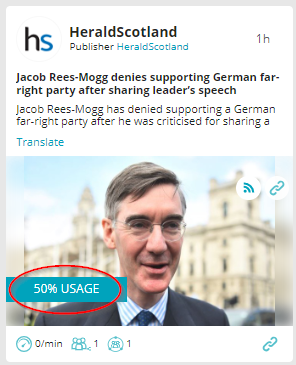 You can see the content usage percentage in the drill-down view by clicking on any Storycard in the main Newswire dashboard. If you wish to see matched stories from outlets in order of Content Usage, click on the drop down menu at the top of the screen.